Welcome to the website of The Bear Race held each year during the Grandfather Mountain Highland Games, one of the largest Scottish Games in the world. The race is full and registration is closed, but if you wish to be placed on the waiting list, please fill out the online registration. The Bear Race proceeds will go to various charities in the area and the ASU Track Program. Thank you and on behalf of our sponsor Zap Fitness, we look forward to seeing you up at the top of the Bear! The Bear race begins in Linville, NC at the corner of Hwy 105 and 221. The race turns right off 221 and winds up steep climbs to McRae Meadows, where the Games are held. It cuts across the track and up the backside to the road where you then run 2 miles up 1000 feet of elevation gain. 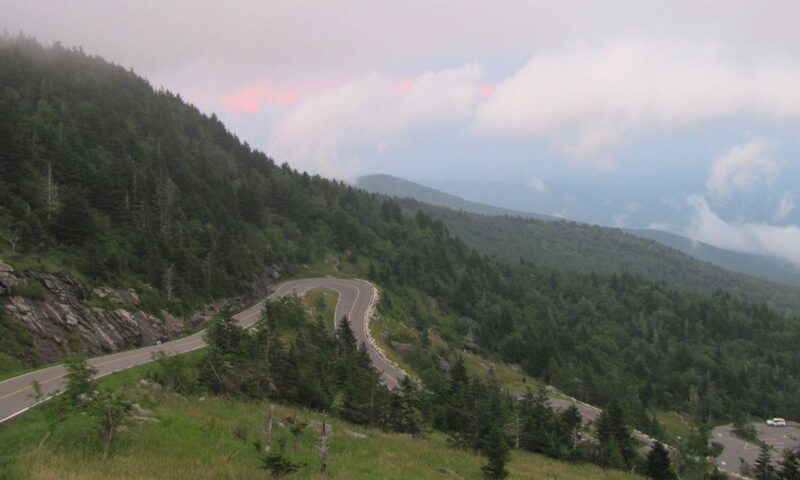 Your views are breathtaking, especially as you round the famous “Forrest Gump” hairpin turn. You will finish at the top of Grandfather Mountain (over 5000 foot elevation) where you will be greeted by thousands of fans who have no where to go as they await the last runner. This unique 5-mile run that will provide challenges that are overcome by the rewards. It is not a race for walkers. Are you interested in running? Online registration opens February 5th, 2019 at 7am. Spectators – we have information about parking at the finish line. The 2018 results are now available!